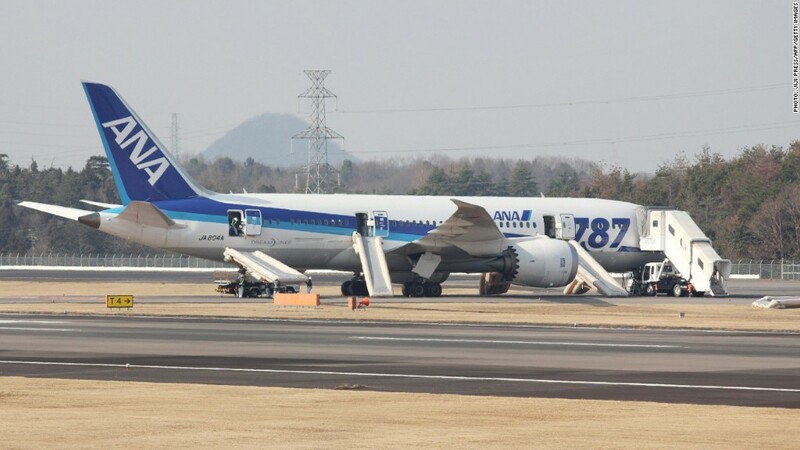 A Boeing 787 operated by All Nippon Airways was forced to make an emergency landing Wednesday in Japan, leading two major operators to ground their Dreamliner fleets. The incident is the latest in a string of problems that have raised questions about Boeing's marquee aircraft and put pressure on company shares. The 787 was traveling from Ube to Tokyo when crewmembers noticed two cockpit alarms. One alert suggested irregular battery activity, while the other indicated smoke was in the forward electrical compartment. The aircraft then made an emergency landing at Takamatsu airport after a burning smell was detected in the plane's cabin. 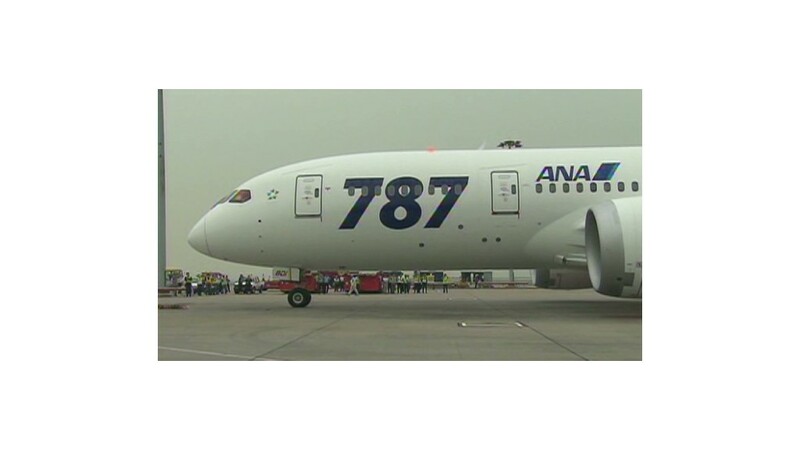 Following the incident, All Nippon and Japan Airlines immediately grounded their Dreamliner fleets. Both airlines said later the aircraft would remain grounded through Thursday. Images shot from the tarmac showed the aircraft was surrounded by emergency vehicles and the plane's evacuation slides had been deployed. A spokesman for All Nippon said a few minor injuries had been reported, and one passenger complaining of back pain had been taken to a hospital. Last week, U.S. and Boeing officials announced a probe of the design, manufacture and assembly of the 787 Dreamliner in the wake of a series of problems that have dogged the jet in recent days. The National Transportation Safety Board said Wednesday it was "gathering information" about the emergency landing. United Airlines (UAL), the only U.S. carrier to have the jet in service so far, said Wednesday that it continues to fly its six Dreamliners. "We inspected all of our 787 aircraft and they are flying as scheduled," said the airline's statement. "We are continuing to support Boeing and the FAA throughout their review." The plane is widely seen as key to Boeing's future, using lightweight composite materials rather than aluminum to significantly improve its fuel efficiency. A representative from Boeing said the company was aware of Wednesday's incident. "All I can say at this point is we are aware of the event and working with the customer," said Lori Gunter, a spokeswoman for Boeing. Boeing (BA) shares were down more than 3% in early trading Wednesday. Shares of All Nippon trading in Tokyo were down more than 1.0%. The latest incident builds on a series of problems that began last week when a maintenance worker discovered an electrical fire aboard an empty Japan Airlines 787 scheduled for departure from Logan International Airport in Boston. Then a Japan Airlines flight bound for Tokyo aborted takeoff from Boston after a pilot on another airplane spotted the 787 leaking fuel. In another incident, an All Nippon Dreamliner flight was canceled after the crew received an error message related to the plane's braking system. To close out the week, oil was discovered leaking from a generator of an engine of an All Nippon Airways Dreamliner at an airport in southern Japan, and a crack appeared in a cockpit window of another All Nippon plane en route from Tokyo to a city in western Japan. Related: Dreamliner - Biggest lemon in history? The rash of glitches represent "a very big problem" from the standpoints of image, engineering, production and customer relations, said Richard Aboulafia, an airline analyst for the Teal Group, based in Virginia. "From every standpoint, it's a very big headache," Aboulafia said, but cautioned that it's hard to tell which incidents should fall under the heading of a production snafu, a system glitch, or both. Boeing has delivered 50 of the aircraft. It has more than 800 unfilled orders from airlines around the globe that will take years to fill. In addition to the Dreamliner assembly line at its Seattle-area factory, it built a new 1,000-worker factory in South Carolina to handle the demand. It hopes to double production of the plane this year to about 10 a month. All Nippon has taken delivery of more Dreamliners than any other airline, with 17 in service, according to aviation consultancy Ascend Advisory. Japan Airlines has seven Dreamliners in use, while United Airlines (UAL) and Air India have six each. A spokesman for Air India said it would keep its Dreamliners in service on Wednesday. The first Dreamliner was put into service by All Nippon in October 2011. But that flight was more than three years behind the aircraft maker's original delivery schedule. - CNN's Tom Watkins, Aloke Devichand, Yoko Wakatsuki, Pamela Boykoff and Ali Velshi contributed to this report.